I'm exhausted. 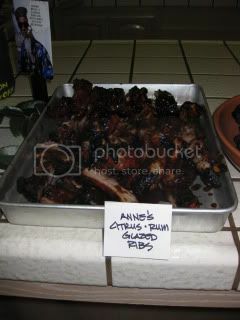 I'm still in a rib hangover from last night. I'm about 90% sure my family should open a rib joint in town, though. 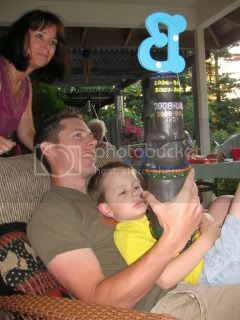 I think this was our best Fathers' Day Rib Cook-Off ever. Nothing like a contest where you get to eat your way through the democratic process. It doesn't hurt anything that everyone in our family are great cooks. Man, it was good. 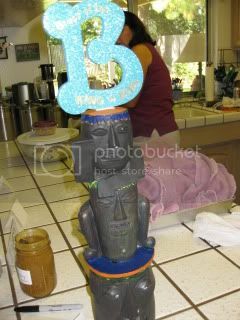 and last year's winner, Bruce, decided to top it with a big fruity, glittered B that says "Bruce is the king of ribs." We're subtle in this family. 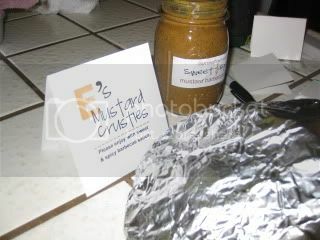 Team P's entry, E's Mustard Crusties, awaiting the judging. Yeah, I'm aware that "mustard crusties" sounds kinda gross. We thought it was funny because that's just how we roll. 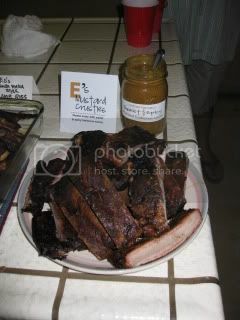 And they really were Mustard-encrusted Hickory-smoked St. Louis Style Spareribs, but that's too long to fit on a card. 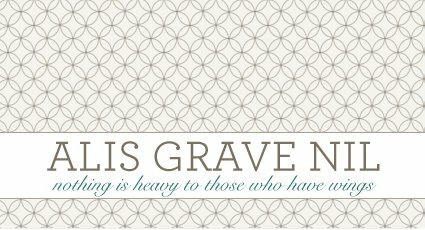 If you read my Gpa's invitation, you know that we were all to show up by 1600 hours, and that entries must be made by 1700 hours. 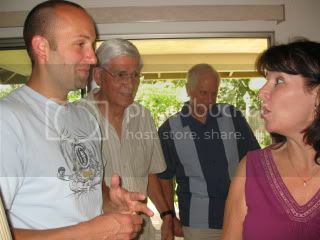 Only apparently nobody in my family can tell military time. Everybody called each other and two people (who shall remain nameless) arrived late. 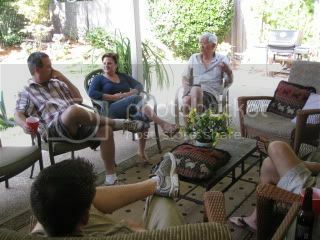 This is us sitting around trying not to get too hungry. Since I only basically ate cucumbers for lunch in anticipation of ribby extravagances, this was a little bit of a problem. My dad and E. Two great dads on Dad's day. Bruce had an entire display this year, replete with Papaya branches he tore off my Gpa's papaya bush just before we got started. I think that qualifies as a rule violation? I'm not sure. I'll have to consult with the family attorney. 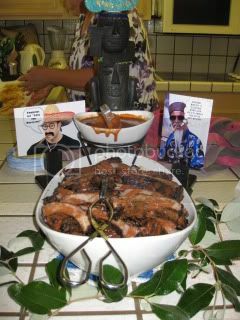 His entry was some kind of Mexi-Asian fusion with papaya BBQ sauce. You didn't hear this from me, but his sauce tasted a bit like a smoothie that Jamba Juice makes. His were sweet and gooey deliciousness. Mmmm, mustardy. Team P brings it in '10. Go big or go home. We chose to go savory, and I think it was a good choice. 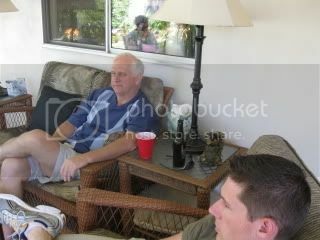 Unkie Dave, Bucko Bro #1. 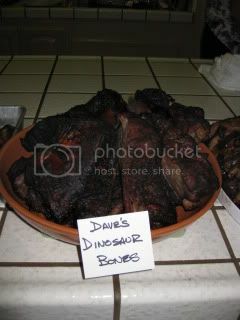 Dino Bones, AKA steaks with ribs stuck in them. I forget what these were called, but they were untrimmed beef something... Giant and smokey and... giant. Grandpa makes the same ribs every single year. No smoker, just BBQ. No seasoning or sauce, just salt and garlic salt. He instructed us yesterday that the salt in garlic salt is different than salt. 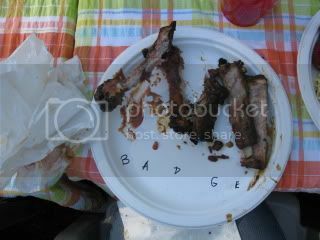 So what you get from Gpa is a salty, salty rib. 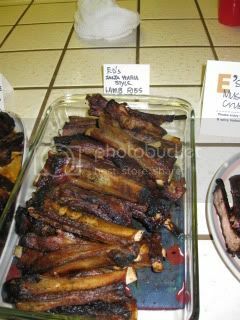 This year he went with lamb ribs. I'm not one for lamb so much (too many lamb dinners on E's back porch in high school while the sheep blehhhhhhed at us from their pen) but these were very good. Auntie Anne always makes something exotic. 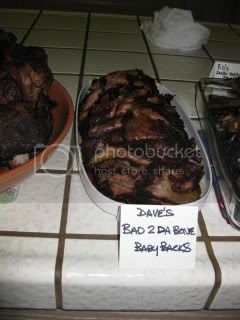 This year it was Citrus-Rum Glazed Babybacks. Very sweet and tangy. 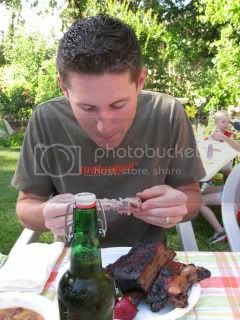 I always have a hard time keeping the ribs straight once I sit down to eat. 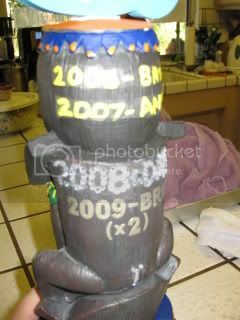 I solved that problem this year with a dedicated rib plate and a sharpie. 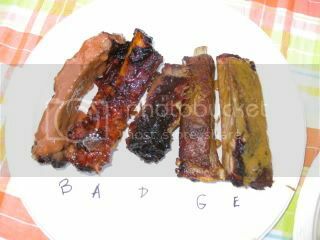 I labeled each rib so I would remember. I'm thinking of instituting labeled plates across the board next year, but I'll have to file a formal application with the International Committee. Three out of six entries (Dino Bones not pictured, as I split one with E) were sweet, so I think our decision to go savory and tangy was a good one. Plus, I completely adore the spicy mustard/Worcestershire sauce combo, so I knew it was going to be good luck. I was going to post this pic and tell you that it was all I had to eat, since I'm trying so hard to be healthy, but I couldn't do it. PS, Mom's macaroni salad is just about the best thing I ever had, as is Auntie Anne's coleslaw. 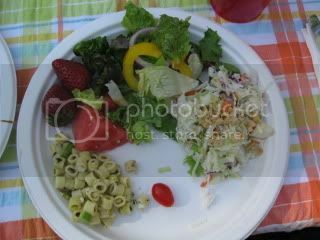 And see that cute little green salad? Yours truly made it with a lovely Garlic-Basil Vinaigrette with loads of fresh basil from the garden. Mmm, mmm, mmm. 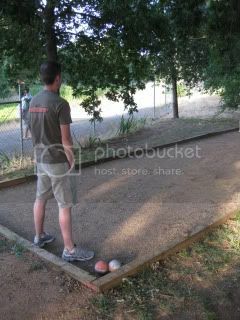 Bocce ball by the creek. Why yes, that is the same place E and I renewed our vows last year. 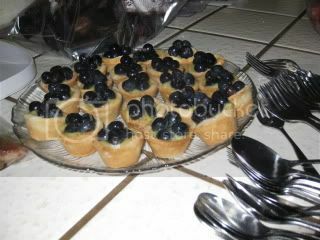 Blueberry tarts filled with fresh lemon curd. Heaven help me and my healthful eating. Chocolate eclair cake. Oh lord. I couldn't fight it. Now if we can just figure out where to put this thing. P really wanted ribs for Father's Day but I couldn't do them in my current gimpy state. Hopefully I will get to them for 4th of July/our anniversary. 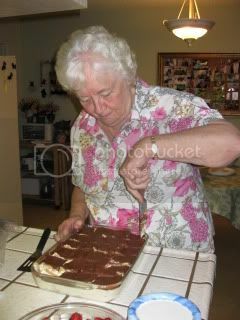 Great pics and thanks for sharing all those great recipes! that looks like such a fun (and delicious) day! 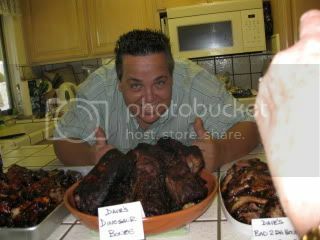 OMG, can you adopt me, just so I can be part of eating all those ribs? 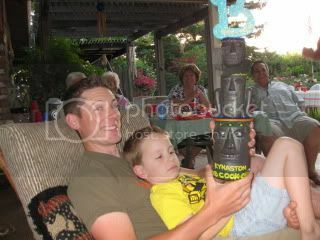 What an awesome Father's Day! Congrats on your win! The cutest story I've read this month. 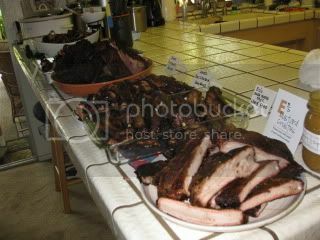 I hate ribs, but I love this family contest! Congratulations on your win. what a great idea! we LOVE ribs in our house!!! hope your weekend was simply delicious. Oh man I love ribs! They make it really hard to be a vegetarian!